This beautiful French wooden game is a star in Canada. Two players, or two teams of two, compete by throwing one of their 12 shuffles in turn. The goal is to place your pucks in the center hole, or position them closer to the center to score the most points. To validate your shot, it is mandatory to touch an opponent's puck (ejecting if necessary) or you will see yours removed from the board. 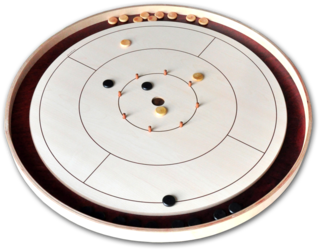 Built with carefully chosen high-end materials, Crokinole is a must in flicking games, fun and very tactical. Moreover, the playing surface has been treated specifically for an exceptional glide.